Powerful novels The Boat People and Brixton Beach, both tackling the Sri Lankan refugee experience but from profoundly different angles, are eminently enjoyable reads but they're more than that: they're important reads. The horrors of the Sri Lankan civil war have inspired tremendously moving, powerful and poignant works of literature. The works of Michael Ondaatje, Shyam Selvadurai, and Nihal de Silva are among the many award-winning novelists who have set their pen to the difficult topic. Violence between the two major ethnic groups -- the majority Sinhalese and minority Tamils -- has wracked the small island-nation for decades. It erupted into full-scale civil war in 1983; a conflict which cost over 100,000 lives, at least half of them civilian. The Tamil minority accounted for the majority of civilian deaths, and the Sri Lankan government has refused to participate in war crimes investigations by the United Nations against the government and military. Two recent novels take as their subject the experience of refugees fleeing the civil war, and both offer powerful, yet very different, insights into the experience of Sri Lankan refugees. The Boat People, a debut novel by Canadian-based Sharon Bala, is inspired by actual events. In 2009 and 2010, as the Sri Lankan civil war reached its horrifying and bloody end, two boats containing hundreds of Tamil refugees arrived at the Canadian west coast province of British Columbia. Bala's narrative is based around the experience of these refugees. The ambitious project has quickly racked up accolades: it's hit Canadian bestseller lists and was one of five contenders for CBC's 2018 Canada Reads contest. 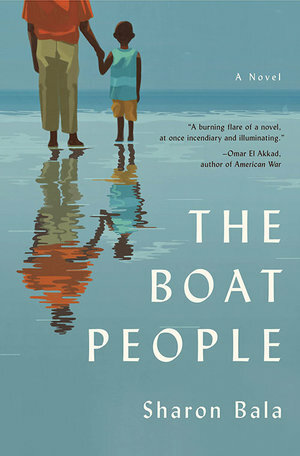 The Boat People is, above all, a political novel, weaving together the experience of two refugees -- Mahindan and his son Sellian -- juxtaposed against the Canadian government's political struggle over how to respond to the refugees. The differing Canadian responses are expressed through Priya, an articling law student who is Canadian but whose family is Tamil in origin, and who is recruited to help the refugees as they seek asylum, and Grace, a government bureaucrat who works as an adjudicator with the Immigration and Refugee Board. The Canadian Conservative government of the time has largely bought into American anti-immigrant rhetoric about terrorists, and Grace is under pressure to deny as many refugee appeals as possible. Priya, for her part, wants to go into corporate law and resents being assigned to help refugees. Yet both find their perspectives and lives changed by their experiences with the refugees. The book develops as a sort of low-key political thriller, building up to the climax of Mahindan's refugee hearing. An impressive array of background characters also influence the thinking of this core cast, including other refugees, family members, co-workers, politicians, journalists. Bala's greatest success lies in depicting the indifferent cruelty of the Canadian refugee system, in which refugees languish for indeterminate periods in a system unofficially designed to serve as an unpleasant deterrent to future refugees, and in which almost laughable fantasies about terrorist plots are given serious stock. The adjudicators themselves are deeply politicized despite their supposed impartiality, and Bala illustrates their flaws and foibles with powerful realism. She draws an ingenious analogy through the use of Grace's mother Kumi, an elderly Japanese Canadian who suffered in Canadian internment camps for Japanese-Canadians during World War Two. Grace's mother became involved in the Japanese-Canadian redress movement, and criticizes Grace for adopting the same attitude toward these refugees as the Canadian government adopted toward Japanese-Canadians during the war (and for which it has subsequently apologized). Kumi recruits Grace's own daughters in her redress movement, and the family gangs up on Grace -- whose friend circle includes conservative politicians -- for towing the government line against the refugees. Upset, Grace retaliates that "it's different", that the contemporary situation of refugees from Sri Lanka, in a world riven by terrorism, is entirely different from that of Japanese-Canadians in World War Two. It's no different, replies Kumi. It has the same ugly root: distrust of the other. "People who forget the wrongs that were done to them perpetuate those same wrongs on others," she admonishes her daughter. Bala's narrative is driven by strong characterization, sharply constructed dialogue and a passionately developed political theme around the injustices faced by refugees. She's come under some criticism for drawing primarily on second-hand accounts and failing to give voice to the refugees who actually lived through the experiences on which she's based the narrative, but she's constructed an important work nonetheless. It's a serious, ambitious political novel that takes itself seriously and offers a scathing yet authentic critique of the xenophobic and racist fears that shape western attitudes and institutional cruelty toward refugees. 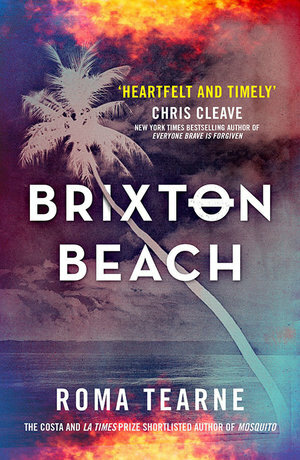 Brixton Beach is also set against the backdrop of the Sri Lankan civil war, but in this case it follows the lives of a family who sought sanctuary in London The key character is Alice Fonseka, who at the outset of the novel is a nine-year old girl living in Sri Lanka. She comes from a mixed family: her Sinhalese mother, Sita, married her Tamil father, Stanley, in what seems mostly to have been a rebellious gesture of solidarity with the Tamils. The marriage has been grudgingly accepted by both sides of the family, but doesn't last; the anger and frustration felt by both main characters at the growing discrimination and hostility in their country exacerbates their own incompatibility with each other. Alice grows up amid parental fighting, while her father takes to drink and infidelity and her mother lapses into depression. Alice grows close to her artistic grandfather, Bee, but even this relationship is doomed not to last. Amid growing violence, Alice and her parents depart for London in the hopes of a better, safer life. It's impossible for a novel set amid civil war and the diasporic/refugee experience not to be political, but author Roma Tearne adopts a subtler tone. Whereas Bala puts the various political conflicts front and centre, Tearne weaves them in as an implacable, unavoidable backdrop. Yet the impossibility of avoiding these subtly constructed political realities gives them an added power. The first half of the book is set in Sri Lanka, amid the growing violence. It emerges slowly and inexorably: while families feast and wed, and children play in mixed groups on the beach, rumours of impending violence grow. Bombings become more frequent; soldiers raid a local school and kidnap a child. Alice's grandfather shelters a former Tamil colleague who's now being pursued by the military. There's a layer of suspense layered subtly throughout the novel, whose excellent pacing leaves the reader with an appropriate sense of horror: how did things go from idyllic to nightmarish so quickly? Tearne manages with literary skill to convey a remarkably realistic political message about the sudden pace of political change. Where Bala focuses on dialogue and fast-paced narrative plot, Tearne's strength lies in her descriptive power. Sri Lanka -- and to a lesser extent, London -- comes alive through her lush prose. Characters' inner dialogues tend to take priority of place over their interaction with each other, but it's carried off superbly and allows for a richer sense of reflection on the complex realities with which they grapple. The novel's overarching theme is that of the difficulty of cross-cultural relationships. The first half of the novel sees a mostly sympathetic and progressive-minded Sinhalese community react with helpless frustration as they see their world degenerate into violence and hatred. They try to do the right thing -- accept intermarrying; give sanctuary to Tamil activists -- yet the combination of microaggressive bigotries they've absorbed, coupled with political events outside of their control, frustrates their efforts both to control their own lives as well as act with moral integrity in increasingly dangerous times. When the action shifts to London, here too the problem becomes one of cultural conflict. The conflicts faced by the novel's protagonists are profoundly different from the ones sketched out by Bala. Interestingly, immigration and refugee issues never enter the picture at all. We are not told how the family manages to immigrate nor what their status is, although it's clearly a legal one. Tearne is uninterested in that element of the narrative, it seems. Instead, her focus lies on the challenges of adapting to their new home. For Alice's father, it's all a great adventure, which only serves to fuel his self-centredness and irresponsibility. Sita suffers silently, bereft of her beloved extended family, still suffering the psychological trauma of a miscarriage. The refugee community disapproves of the parents' intermarriage just as much as the Sri Lankan communities of both their parents did back home. As Alice grows up, she too faces the difficulties of adapting: first in school, where she's unable to make the friends she'd hoped for, and then in her romantic relationships. Tearne succeeds masterfully at portraying the difficulties of a romantic relationship between a white Briton and Sri Lankan immigrant like Alice; one senses that she writes from bitter experience. Her insight into the psychology of such relationships is one of the most ingenious literary achievements offered by this book. The book is semi-autobiographical; Alice bears more than a passing resemblance to the experience Tearne herself went through as a young Sri Lankan refugee in the UK. The book is not interested in the politics of the refugee experience, but rather with the refugee's inner life, their psychological coming to grips with their situation of displacement and alienation. The three primary characters allow Tearne to explore a range of responses to the difficulties imposed by this experience: from Sita's deep-seated depression and sense of profound loss, to Stanley's libertine narcissism in his new home, to Alice's struggle, torn between the desire for integration and acceptance on the one hand, and pride in her identity on the other. These two powerful novels by two very different women, both tackling the Sri Lankan refugee experience but from profoundly different angles, are eminently enjoyable reads but they're more than that: they're important reads, in a world where the experiences of which they each convey a differing angle shape the painful realities of so many.